Once in a while a book comes along that gets people all riled up, bringing forth either enthusiastic praise or vehement wrath. 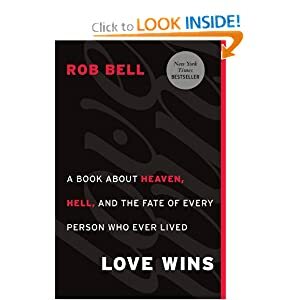 Such a book is LOVE WINS: A BOOK ABOUT HEAVEN, HELL, AND THE FATE OF EVERY PERSON WHO EVER LIVED by Rob Bell. Check out the 563 customer reviews at Amazon to get a flavor of the furor. To many outside the church such a belief solicits a “So what, who cares?” response. But to the thousands of believers who define their faith on the tenet of eternal damnation unless one makes a public profession of faith in Jesus Christ, them is fightin’ words. I decided I needed to read the book and judge for myself. This was my first exposure to Bell, who is surely an engaging speaker. The style of the book reads like an interesting sermon series. It begs to be read aloud. The placement of words on the page is often poetical. Rather than a pedantic expression of his opinions, Bell asks a lot of questions about the basic beliefs of scores of Protestant churches. He is logical—and disturbing. If God is an “all loving Father,” then how can he cast his children into everlasting fire? Hmmm. For Bell, the question isn’t so much about what happens “over there,” but what is happening “here.” Is there a hell? Open the newspaper, read about the wars, famine, mass executions in Mexico, the domestic violence, sexual slavery. Hell? Why sure. It is here and now. The real question is how to bring forth “Your Will on Earth as it is in Heaven” as envisioned in the Lord’s Prayer. Bell’s answer is coming into relationship with the living Christ. The expansive, can’t-be-contained or-totally-understood Messenger of the Good News. Bell speaks to the disenfranchised, the people turned off by the fire and brimstone message. He breaks down the dogmatic walls. For those comfortably dwelling within those walls, he is a heretic. For those outside the walls, he offers hope.